The FBI’s week-long investigation hit the midway point Wednesday as senators anxiously awaited the report and the bitter war of words over Judge Brett Kavanaugh’s Supreme Court confirmation process escalated. Less than 24 hours before, Trump mocked Christine Blasey Ford’s testimony at a rally Tuesday night amid chants of “we want Kavanaugh” from the crowd. “Thirty-six years ago this happened: I had one beer,” he said. Ford’s attorney blasted Trump after the rally in Mississippi. Christine Blasey Ford shakes hands with Rachel Mitchell, a prosecutor from Arizona, after she interrogated her before the Senate Judiciary Committee on Capitol Hill in Washington, Sept. 27, 2018. “A vicious, vile and soulless attack on Dr. Christine Blasey Ford. Is it any wonder that she was terrified to come forward, and that other sexual assault survivors are as well? She is remarkable profile in courage. He is a profile in cowardice,” Michael Bromwich wrote on Twitter. Trump’s remarks don’t seem to be helping his vigorous campaign with some key lawmakers whose votes will ultimately make or break Kavanaugh’s confirmation. “The president’s comments were just plain wrong,” Sen. Susan Collins, R-Maine, a key Republican vote, said. Here’s how the story is developing. Senators on the committee tasked with voting on embattled Supreme Court nominee Brett Kavanaugh’s future on the bench are apprehensively awaiting parts of the FBI report into allegations made against the judge by Christine Blasey Ford. Immediately after that report is filed, Senate Majority Leader Mitch McConnell is expected to move the vote forward. Senators will then likely vote on Saturday to confirm Kavanaugh to the court. If they don’t have the votes, the nomination fails. However, as of Wednesday afternoon, senators did not expect to receive a full report of everything the FBI investigated in their week-long investigation — rather, they expected interview summaries without any drawn conclusions or summaries from the FBI, Republican Sen. Bob Corker told reporters after a closed-door GOP lunch on Capitol Hill, because the FBI does not make conclusions in a background investigation. White House press secretary Sarah Sanders defended Trump’s rhetoric on due process after she was asked about his position on the Central Park Five. Three decades ago, Trump made a veiled call for the execution of the now-exonerated five black and Hispanic teenaged suspects. Another reporter picked up the same line of questioning, suggesting that Trump believed both the Central Park Five and Bill Clinton were guilty, and then asked if he changed his mind on the former since they’ve been exonerated. Decades ago, Clinton admitted to having an inappropriate relationship with former White House intern Monica Lewinsky. 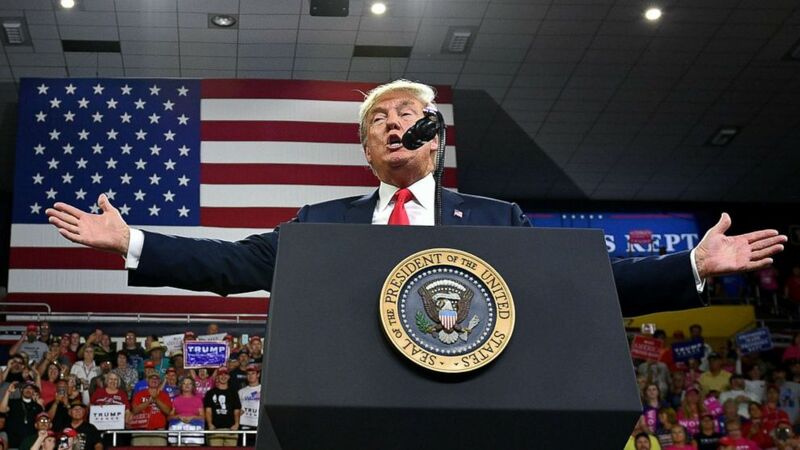 The White House defended Trump’s mocking of Ford during a rally Tuesday night. “They have to determine what the facts are of this case. That’s one of the reasons that they asked and begged for the FBI, and delayed a hearing vote so they could get more facts on this case. We expect the FBI to turn those facts over to the Senate and they can make a determination based on that,” she said. Sen. Lindsey Graham, R-S.C., a staunch ally of Trump throughout the confirmation process continued his defense Wednesday morning at the Atlantic Festival in Washington, D.C.
“I don’t like what the president said last night,” he added. “I don’t like what the president said last night,” Sen. Lindsey Graham says about Pres. Trump’s mockery of Dr. Ford at a rally. Despite saying that he “listened” and “heard” Ford, he also refuted part of her testimony. “I don’t know how she knew she had one beer,” he said. Graham said he believes Kavanaugh is qualified for the court, and that he would not disqualify the judge — despite concerns raised by some senators on both sides that he may have seemed too partisan during his performance in Thursday’s hearing. The FBI is investigating “credible” allegations of sexual misconduct made by Ford and Deborah Ramirez against Kavanaugh after the Senate Judiciary Committee weighed testimony from both Kavanaugh and Ford on her allegation during an hours-long hearing. In response to pressure from the Senate, the White House eased limitations on the investigation that Trump approved on Sept. 28. The committee requested that the investigation concludes after one week, which would be this Friday. But the reopened background investigation could be completed sooner, according to Senate Republican and White House sources familiar with the process. The White House specifically requested FBI interviews with four people: Kavanaugh high school friends Mark Judge and P.J. Smyth; Leland Keyser, who Dr. Christine Blasey Ford identified as at the gathering where she was assaulted; and Ramirez, who’s lawyers provided a list of more than 20 additional witnesses to interview. The FBI has not interviewed Ford, according to her lawyers who sent a letter stating that they have not received any response from anyone involved in the investigation, despite multiple requests, and Julie Swetnick, Kavanaugh’s third accuser. According to Senate Majority Leader Mitch McConnell and Senate Judiciary Committee chairman Chuck Grassley, the FBI’s report on the allegations are not expected to be made public. Senate Judiciary Committee Chairman Chuck Grassley holds up a letter from Mark Judge, longtime friend of U.S. Supreme Court nominee Brett Kavanaugh, on Capitol Hill in Washington, Sept. 28, 2018. On Tuesday, McConnell vowed to reporters that the Senate will vote by the end of the week. “It’s time to put this embarrassing spectacle behind us,” he added on Wednesday morning. ABC News’ Ali Rogin, Mariam Khan, Trish Turner, Cheyenne Haslett, and John Santucci contributed to this report.